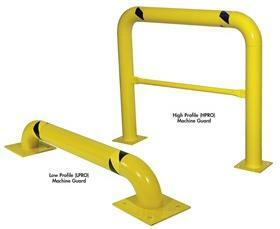 These durable and tough guards help protect your personnel and equipment. May be bolted (1/2" dia.) to surface or secured into concrete. Steel construction provides a barrier that can minimize damage from fork truck and other equipment. Mounting hardware not included. Painted Safety Yellow. FOB Shipping Point.